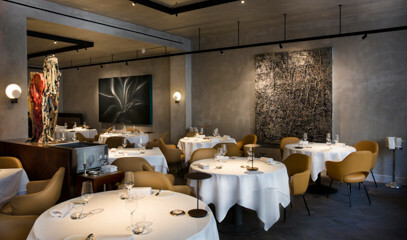 Experience 'la belle vie' at double Michelin-starred restaurant, The Greenhouse. Enter the restaurant through a striking tree-lined pathway, and enjoy a unique, light touch on classic French cuisine. Opened in 1977, the Greenhouse has become a long-standing institution in the Mayfair restaurant scene. With its kitchen currently under the helm of Chef Alex Dilling, the restaurant is now re-defining classic French fine-dining. His culinary journey started when he worked for the master of French gastronomy, Alain Ducasse in New York. Moving on to Chef de Cuisine at Caviar Russe in New York, he earned a Michelin star in 2013, a clear highlight and-defining moment in his career. Coming back to London, Chef Dilling found himself at Hélène Darroze at The Connaught where he led the team as Executive Corporate Chef, overseeing London and Paris sites and attending worldwide global events. Internationally renowned, the Greenhouse is one of only four restaurants in the world to win the Wine Spectator Grand Award every year since 2005, the highest award given for an exceptional wine list. The restaurant's Sommelier, Elvis Ziakos, has put together perfect accompaniments to each meal, from one of London’s finest wine lists. With an inviting and warm atmosphere, you'll enter The Greenhouse through a tree-lined entrance. Enjoy lunch for two, made up of an irresistible selection of dishes highlighting the Chef's penchant for introducing exotic produce into French classics. Savour dishes founded on the finest seasonal ingredients from the highest quality sources, with favourites like 'Foie gras with Borlotti beans, Verbena and peach' or 'Cherry Burlat, Manjari chocolate and Fromage blanc'. This experience is valid for redemption within six months from the date of issue. The Greenhouse is open for lunch Tuesday to Friday, 12pm to 2.30pm (excluding bank holidays). The earliest and latest seating is available at 12pm and 2pm, respectively. Please note some dishes might require supplement charge﻿﻿, those will be specified on the menu on the day. Service charge (12.5%) is not included; this is left to the guests discretion on the day. The menu is subject to seasonal change and availability. Please state any dietary requirements at the time of booking. The Greenhouse can accommodate vegetarian, gluten and lactose-free diners. Note that at least 24 hours' notice is required for any cancellations or amendments to bookings. In the event of cancellation, an alternative date will be offered. This experience is not available on Saturdays, Sundays Christmas Eve, Christmas Day, New Year's Eve, New Year's Day and Valentine's Day. All bookings are subject to availability We recommend booking at least two weeks in advance to guarantee desired dates and times. Subject to seasonal change and availability. One dish from each section.